EU withdrawal amendments: How did your MP vote? What does this mean for Brexit and parliamentary process now? Last night, NQ had another late one as we covered the Brexit amendments live. From today the records on which way MPs voted individually have been released. Below are the voting records from last night's parliamentary session. Each MP is coloured according to their party; blue for Conservative, red for Labour and grey for independent. What follows is the voting record for each amendment, which I will describe in greater detail later on. 1 is the Corbyn amendment, 2 is the Blacford amendment, 3 is the Grieve amendment, 4 is the Cooper amendment, 5 is the Reeves amendment, 6 is the Spelman amendment and 7 is the Brady amendment. They are marked F if they voted for the amendment, A if they voted against it and N/A if they abstained. Leader of the Opposition, Jeremy Corbyn's amendment allowed parliament to debate and vote upon a number of alternatives to the Brexit plan including a permanent customs union and a people's vote. The motion was defeated although most Labour MPs voted for it. 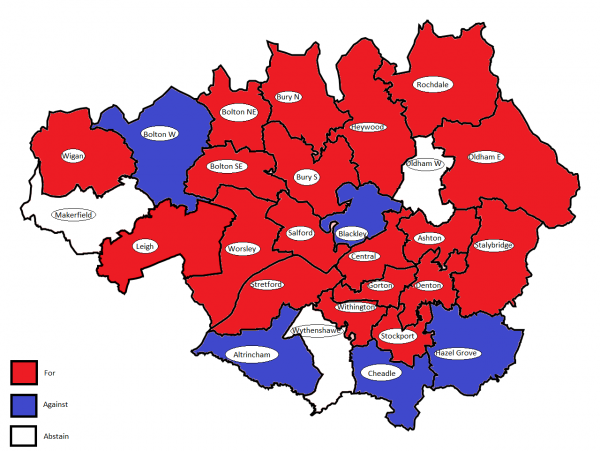 The voted in Manchester panned out as below. SNP Westminster leader Ian Blackford's amendment made provisions to extend article 50 and recognised the role of each of the UK nations in deciding what direction to take with Brexit. This motion was heavily defeated, with only the SNP and Plaid Cymru voting for it. 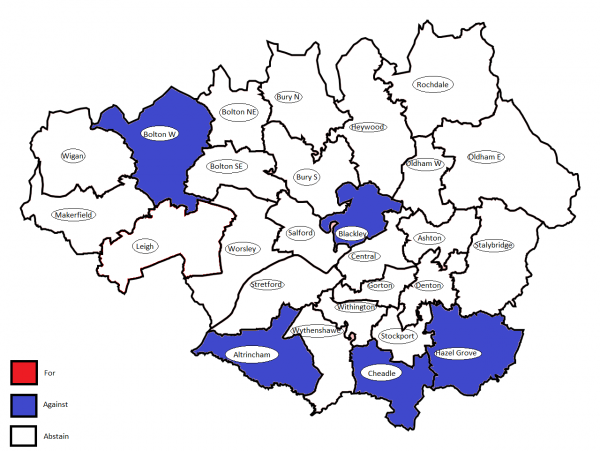 Most Manchester MPs abstained. Tory MP Dominic Grieve's amendment forced the government to make time for MPs to discuss alternatives to Brexit before the 29th of March. The motion was popular cross-party but incredibly unpopular within his own party. Manchester MPs mostly voted for it. Labour MP Yvette Cooper's amendment told the government to extend the article 50 process and rule out a no deal Brexit. It was given a fighting chance of passing by experts, but narrowly slumped to defeat nationwide. Labour MP Rachel Reeves' amendment required the Prime Minister to ask the EU for an extension to article 50. It was a watered down version of the Cooper amendment, and while it had Labour's support, it did not pass the house. Tory MP Caroline Spelman's amendment simply stated that parliament rejected leaving the EU without a deal. 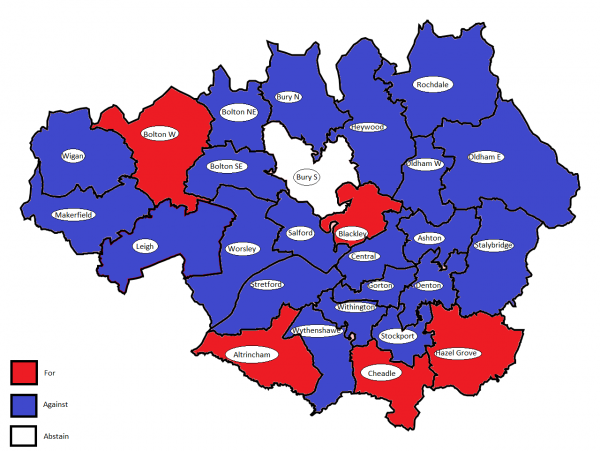 It narrowly passed and was also the only amendment that had no abstentions from Manchester MPs. Altrincham & Sale West Tory MP and chairman of the 1922 committee, Sir Graham Brady's controversial amendment, told the government that parliament will not back a deal unless changes to the Irish backstop are made. What these changes might specifically be is anyone's guess, but it passed and Theresa May considered it to give her a mandate with which to negotiate with the EU. Most Manchester MPs voted against it, but it received just enough votes across parliament. Only two out of the seven amendments passed; the Spelman amendment and the Brady amendment. The Spelman amendment says parliament rejects a no deal Brexit, but does not outline what it will back instead so changes the course of debate little. The Brady amendment rejects the Irish backstop, much to the delight of leaders who feared it would be used to keep the UK permanently tied to the EU. However, the EU have ruled out re-opening negotiations on the backstop, or indeed the withdrawal agreement, so parliament's mandate seems to be falling upon deaf ears. The view from Ireland is one of bewilderment. Ireland does not wish to see a return to hard borders on her soil and the backstop prevents that happening should the UK be unable to secure a trade agreement before the end of the transition period. The view, therefore, is the UK parliament is trying to drag Ireland down with it. James O'Brien said on LBC this morning that reunification of the island of Ireland looked likely to happen within our lifetimes as a result of this move. In parliamentary terms, the Tories hold just enough sway in the house to still get bills through, much to Labour's frustration. Will this be reflected in the polls? Will Brexit destroy the Tory party or will people decide Labour did not do enough in parliament? Theresa May's Brexit deal: Which way did your MP vote?